Nike's iconic basketball sneaker celebrates its 25th anniversary this year. 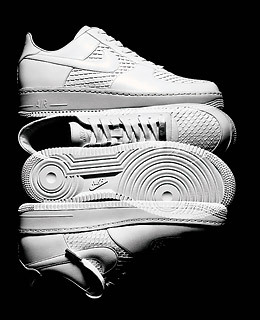 Adhering to Nike's standards of innovation and craftsmanship, together with simple good looks, the AF1 has been a favorite of celebrities and on the street from the start. To mark the occasion, Nike is going for a slam dunk by introducing an updated AF1 collection, including the $2,000 Anaconda, above.